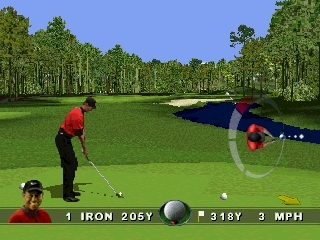 PGA Tour 96 was three years and four games ago, but EA is still using pre-rendered environments and digitized player animations. The game runs at a poor frame rate, mostly due to the new fluid camera that follows the path of your ball, which was well intentioned but ultimately makes the game look worse. EA apparently was trying to appeal to the casual market by bringing Tiger Woods on board, but the money perhaps would have been better spent on development. The franchise felt stale already, and yet another year of the same old thing just makes the game feel old and tired. As with the 98 edition the game features 5 courses, but 2 of them, TPC at Sawgrass and TPC at Scottsdale, are making their second appearance in a row. New to the series are TPC at Summerlin, TPC at Las Colinas, and TPC at Southwind. The roster of tour pros has been cut down to 8, and only Tiger is new to the series. It is also no longer possible to create your own golfer, although you can edit the name of one of the included PGA players. Instead of a helpful announcer the only voice you hear is Tiger’s as he complains about your bad shots, but at least the ambient noise sounds more realistic, if you turn off the music that is. The game still uses the same 3-click system, but it is now possible to add spin to the ball. While this sounds cool at first, the spin control is used while the ball is in the air and not during the swing, so the spin control acts as more of an error correction mechanism which just dumbs down the experience. From the opening FMV sequence selling golf as an extreme sport to the poor production values, it seems obvious that EA was targeting the casual audience whose interest in golf was cultivated by the rise of Tiger Woods. As golf games go on the Playstation, this one ranks towards the bottom. Buy Tiger Woods 99 on GameGavel or Amazon. Tagged 1998, 99, EA, Golf, PGA Tour Golf, Playstation, PSX, Review, Sony, Sports, Tiger Woods. Bookmark the permalink.